The Wild Horse Pass Hotel & Casino, in its current location and configuration, opened in October 2009. At night, its electric blue lighting signifying the Gila River makes it easy to see from the I-10 highway. While the address is in Chandler, it is located, owned and operated by the Gila River Indian Community. The hotel is consistently recognized as a deluxe destination, awarded recognition by AAA and other professional travel organizations. No, it isn't Scottsdale. But you won't pay Scottsdale prices, either. Read more reviews, check availability at TripAdvisor. Since 1993, when the original gaming compact was executed, the casino has undergone a variety of upgrades and transformations to bring it to its current status as a hotel and casino. There are more than 1,000 slot machines, 70+ gaming tables, poker tables and a high-limit poker area. The Wild Horse Pass Hotel & Casino slot machines are a draw for locals, but the conference facilities, restaurants and guest rooms are no afterthought. This is an appropriate choice for business meetings and conventions, where attendees don't have to travel far (or at all) for dining options and entertainment. The entire facility seems brand new, even after six years. The hallways are attractive; the guest rooms have wireless access, comfortable seating (for one), and are crisply designed in tones of brown. There is minimal artwork in the rooms; the conference center hallways are really the only place to enjoy original art. I might not think of the Wild Horse Pass Hotel & Casino as a first choice for a wedding or family reunion, unless the casino is the focal point of the festivities. While I am certain that the banquet department can assist with wedding celebrations, this isn't the place that comes to mind for romance. After all, this is not a resort with outdoor grassy areas or lake views or cozy, rendezvous spots. Likewise, I don't consider Wild Horse Pass Hotel & Casino a prime destination for family travel. There are no activities for children here -- no Kids Club, no game rooms, no organized outings. Children are not permitted to attend most shows, and, naturally, they are not permitted on the casino floor except to walk the perimeter to access a restaurant. If you are staying at the hotel and you bring the family, you can certainly take the kids (or let them take the shuttle if they are old enough) to Rawhide Western Town where they can explore their inner cowboy/cowgirl! They can also go horseback riding at the nearby equestrian center. The hotel pool is always an option, but there are no water slides or waterpark features here. As a conference hotel, or as a destination for locals and visitors who enjoy high-quality entertainment and dining along with casino activities, I highly recommend Wild Horse Pass Hotel & Casino. A perfect weekend for me? Dinner at Shula's or before-show appetizers and a cocktail at Classics Lounge, a great performance by a nationally/internationally recognized star or band at one of my favorite intimate venues, a quick stop at a few slot machines, a night in a clean, pleasant room and blue corn pancakes with eggs or a chorizo burrito for breakfast at Café 24/7. Let's talk hotel amenities! On the first page I mentioned that Wild Horse Pass Hotel & Casino has a nice, outdoor heated pool. Cabanas are available to rent there. It isn't a particularly lush area -- mostly concrete and opposite a parking lot, but the pool and spa make a nice break from the casino. Check the hours for food and beverage service at the pool. There is a large, sparkly fitness center with a variety of late-model exercise equipment and machines for your workout. The Casino - On the first page I already describe the focal point of the hotel's draw, which is the casino. It covers 100,000 square feet -- that's almost two football fields -- arranged comfortably with a bar in the middle. If you already have a Players Card (they are free) you might not have to stand on line at the Players Club window very often; there are electronic kiosks where people sign up for promotions and contests. Like most casinos, there are varying levels of Players Club members. 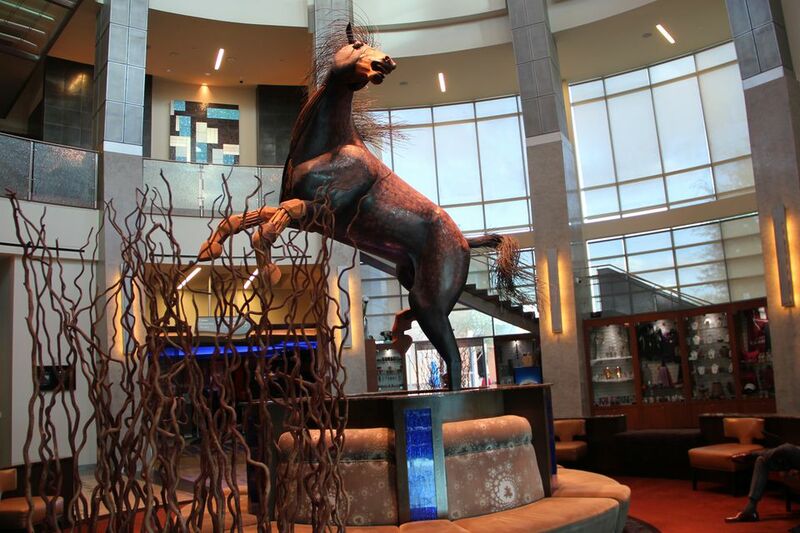 the club at Wild Horse Pass Hotel & Casino is based on a point system. You earn points based on how much money you play. Those points can be used for bonus play, discounts, show tickets, meals and gifts. The Players Club card and associated points are good at all three Gila River casinos: Wild Horse Pass Hotel and Casino, Vee Quiva Hotel & Casino (West Phoenix), and Lone Butte Casino (Chandler). Dining - Whether you want a burger, pizza, a pastrami sandwich, lettuce wraps or a fine steak, you can find it at Wild Horse Pass Hotel and Casino. Café 24/7 has a full menu of sandwiches, burgers, salads, entrees and breakfast items, all of which are available all day and all night. Have pancakes at 8 p.m. or a burger at 4 a.m. Ling & Louie's is a sit-down full-service restaurant that provides Asian cuisine with many choices. I recommend the Evil Jungle Princess or the Firecracker (but I like it hot!). You won't have to increase your credit limit to dine here! Cocktails, wine and beer are offered here. If there is a popular show at Ovations! that night, you might not get into Ling & Louie's unless you are very early. The star of the dining options at Wild Horse Pass Hotel and Casino is Don Shula's American Steak House. Former football coach Don Shula has a handful of restaurants around the U.S. This one is dedicated to the 1972 Miami Dolphins and their perfect season. They were undefeated, finishing the season with 17 wins and no losses. It never happened before and it hasn't happened since. You can see all 17 commemorative footballs displayed in the restaurant's foyer. The football theme continues with hand-painted footballs, signed by Shula, listing the premier steaks. The photos on the walls are of football scenes and heroes back in the day, and the background music pays tribute to the crooners of decades past. If football doesn't interest you, not to worry. The relationship to football ends when you are presented with the traditional full menu of steak and seafood entrees. Sides are offered à la carte and are suitable for sharing. This is an upscale dining experience; steaks here are excellent. Don't forget to check online or at the door if there are any specials. I had a filet mignon and lobster tail dinner with salad and sides for $50 that was not on the menu and not mentioned by the server. Delicious and reasonably priced. In general, though, expect to spend between $50 and $100 per person or more (plus beverages, tax and tip) for a three-course meal. Burgers, pizza, deli sandwiches, coffee/pastries and sushi are also offered at various casual locations around the casino. Entertainment - Ovations LIVE! Showroom hosts world-famous performers as well as local tribute bands and special events, like comedy shows and boxing. Most shows are either 18+ or 21+, so check the show description before buying tickets for the kids. With 1,400 seats arranged in bowl formation on two levels, it is an intimate show experience. It is one of my favorite venues in the Phoenix area! There are restrooms and a bar inside Ovations, but you may bring in food from one of the Casino's casual dining spots. Players Card members are often offered discounts to tickets if they are purchased at the Box Office. The Lounge right outside the Casino on the main floor is a comfortable place to enjoy refreshments and listen to live musical entertainment Thursday through Saturday after 8 p.m.
Chrome Nightclub is open on Friday and Saturday nights. There is a cover charge. Dress to impress and dance to the tunes of the DJ. no reciprocal agreements with Aji Spa at nearby Sheraton Wild Horse Pass, or golf at Whirlwind, or Wild Horse Pass Motorsports Park or Rawhide. Wild Horse Pass Hotel & Casino is located in Chandler, Arizona on the Gila River Indian Community. That’s south of Phoenix. It is about 14 miles from Phoenix Sky Harbor International Airport. If it isn’t rush hour, that drive should take you about 20 minutes. There is no public transportation that gets you here, so you'll need to rent a vehicle or travel by taxi or car service if you are a visitor to the area. Less than seven miles away you'll find Chandler Fashion Center, one of the newer malls in the area, as well as a 20-screen movie theater complex. About eight miles away, Arizona Mills Mall is an alternate shopping area that also has a few attractions the kids will enjoy, like Sea Life Arizona, movie theaters and an IMAX. In 2016 a LEGO attraction opens there, as well. The closest Spring Training stadium is Tempe Diablo Stadium, home of the Los Angeles Angels of Anaheim. Arizona State University and Downtown Tempe are reasonably close, about 20 minutes away. Leave about 30 minutes to get to Downtown Phoenix theaters, concert venues and sporting events. If your travels will take you to Tucson or other Southern Arizona locations (or even Rocky Point, Mexico), the Wild Horse Pass Hotel & Casino is right off I-10 south of Phoenix, making those destinations much shorter trips.